Cristian is originally from San Cristóbal Alta Verapaz and was selected as a GOJoven Scholar when he was 17 years old. Cristian is a fourth semester student in Industrial Engineering and has helped to implement a workshop for young people and adolescents. He participated with different organizations based on sexual health, sexual health reproductive rights, and political advocacy in different spaces. He is also engaged with working groups in FUNDESA (Foundation for the Development of Guatemala). 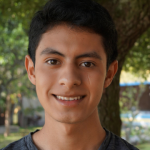 Currently, Cristian serves as the Communications Coordinator for GOJoven Guatemala. He is a young man who respects the opinions of others and defends many human rights, and especially those of adolescents.